Obituary for Edward L Owens Jr. | Schlup-Pucak Funeral Home Inc.
Edward L. "EJ" Owens Jr., 2, passed away suddenly in his home on April 1, 2019. 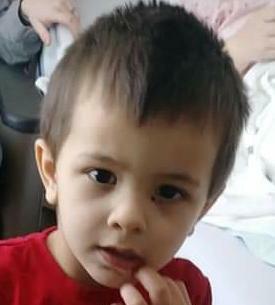 This precious loving little boy is survived by his parents, Edward and Christina (Thomas) Owens of Akron; grandparents, Wayne (Nancy) Thomas of Akron, Dan "Grandpa Teager" (Mary) Kirkman of Kent, WA; brothers, Noah Thomas and Chris Inch of Akron; sisters, Preston Crislip of Zanesville, Alyssa Mathas of Las Vegas, NV and Kelly Inch of Akron; aunts, Jen and Melissa Thomas of Akron; uncle, Nathan (Kelly) Kirkman of Kent, WA and cousins, John Thomas, Aidan and Landyn Thompson, Vayda Thomas of Akron, James Kirkman of Kent, WA. Funeral Services will be held at 12 Noon, Saturday, April 6, 2019 at Firestone Park United Methodist Church, 250 N. Firestone Blvd, Akron, Ohio 44301 with Rev. Sam Martin officiating. Friends may call two hours prior to service time. Private burial will be held at Greenlawn Memorial Park. For those that wish, memorial contributions can be made through the Go Fund Me account set up for the family at gf.me/u/rv3z73.